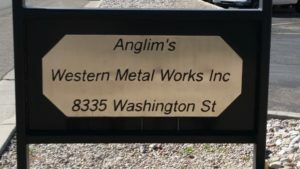 Anglim’s Western Metal Works is a full-service welding and metal fabrication shop. In addition to parts manufacturing, prototype design, and other related services, we also offer a variety of artistic metalworking services including sculptures, gates, and custom signage. A custom metal sign draws attention to your business and leaves a lasting impression. If you need a cut metal or welded sign for your business, count on us to bring your vision to life. Do you have a design in mind? From lettering to complex flourishes and imagery, we can transfer your design sketch to a three-dimensional metal sign. Utilizing highly precise waterjet cutting tools, we can create intricate components with utmost care, ensuring smooth edges and tight corners. We also have experience in metal artwork and design, allowing us to help you bring your vision to reality. Just have some vague ideas? Sketch them out, and we’ll help you refine it until you’re satisfied. You can see some of our finished projects here to get an idea of what we can do for you! We can work with any weld able metal, including but not limited to: stainless steel and aluminum. We’re also happy to create both flat and three-dimensional designs and custom signage of any size and dimensions. To learn more about our available welding and fabrication services, contact us today. Looking for a custom-made sign for your business? Call 505.822.9170!